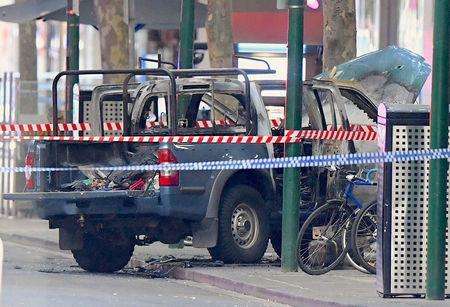 "We are still trying to piece together whether the vehicle was lit, then he got out the car or whether he got out of the car and then the vehicle took flame," Victoria Police Commissioner Graham Ashton told reporters. The attacker, who police said was 31, died in hospital, as did one of the victims, Ashton said. "From what we know of that individual, we are treating this as a terrorism incident," he said of the attacker. Asked about what the attacker had been planning, Ashton referred to the gas cylinders in the car and said: "You could make certain assumptions from that." Victoria police declined to comment when contacted about Islamic State's claim. The militant group also claimed responsibility for a deadly siege in the city in 2017 when a Somali man was killed by police after taking a woman hostage. Asked if the attacker had recently traveled to Syria he said: "That is something we might be able to talk more about tomorrow." Authorities say Australia's vigilance has helped to foil at least a dozen plots, including a plan to attack downtown Melbourne at Christmas in 2016. Prime Minister Scott Morrison said in a statement released on Twitter: "Australia will never be intimidated by these appalling attacks." A witness, Markel Villasin, told Australian Broadcasting Corporation radio: "Bystanders were yelling out 'just shoot him, just shoot him'." They did. In December 2014, two hostages were killed during a 17-hour siege by a "lone wolf" gunman, inspired by Islamic State militants, in a cafe in Sydney.